In my novel Eden's Trial, I explored how aliens might judge us as a species. Rather than doing so based on perceptions of right or wrong, they would probably base their decision on whether we were useful to the galaxy or potentially harmful to it. Their judgement would possibly be harsh. And there would be no right of appeal. They could look at our history, but they would also probably consider the current leaders of the human race. Given that we're not exactly kind to our planet, and have a propensity for wars and glaring inequalities, I wanted to put something in our favor, and so the judgement comes after Earth has been ransacked by an alien race (the Q'Roth), abetted by genetically-altered humans called Alicians, led by Sister Esma. Despite this, the trial doesn't go well for what is left of mankind. Micah stood mesmerized by the blue-green globe as it rolled in slow motion around the funnel suspended in space beneath them. It was an illusion, a macro-hologram of some sort, but looked incredibly real. The outer rim of the inverted, thundercloud-grey cone appeared hard, ceramic; he almost expected to hear a grinding noise as the replica of Earth toiled its way around the circumference. Towards its centre, the funnel descended like a gaseous whirlpool into darkness, a faint fire-light glow reaching up from its core. He didn’t need to be Level 4 to grasp the implication. The ball resembled Earth as it had been – trawled from one of Zack’s memories, no doubt – not the post-nuclear orange dustbowl which Micah remembered most clearly. Staring at it, he felt hollow, with an attendant nausea. All that remained of his world was a pale echo of humanity’s home. He gazed upon the treasure they had squandered. It was too easy to blame everything on the Alicians. They were a contributory factor, but humanity’s inherent weaknesses had facilitated its own downfall. 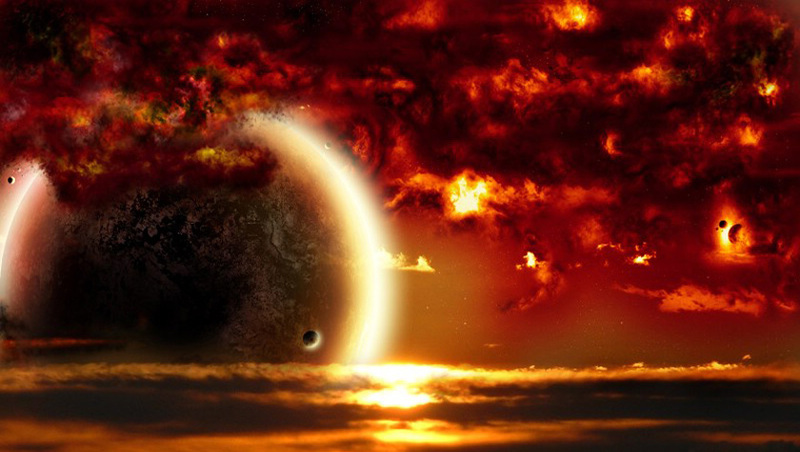 He tugged his eyes away from paradise lost, and tracked across to the far side of the vista, to a graphite ball scarred with glowing scarlet rivers. Pinpricks of blood-coloured light stabbed out from the planetary simulacrum. He imagined a sea urchin whose spines had been ripped off, oozing its life force into naked space. Far above that ball, on a platform higher than the one for him, Sandy and Ramires, stood two Q’Roth warriors. They looked more powerful than the ones he’d seen before, their lower legs splayed, and their mid and upper legs folded together in an Escher-like snake pattern. They were completely immobile, but he had the sense they were somehow spitting on the humans who had slain their ambassador. To his far right, on a small disk, Zack’s Transpar stood as if to attention – like Zack never had – emphasising that this was no longer Zack, just an alien replica. Micah’s friend, and mentor, was gone. He noted that the three parties – humans, Q’Roth, and Transpar, were at three cardinal points of the compass. He looked to the logical fourth point, but there was just empty blackness, no walls in any direction, only darkness framing his opponents, the Transpar, and the swirling funnel. The two balls circled in the same direction, the Q’Roth home planet having moved a few degrees around the circumference as far as he could judge. Then he saw what Ramires had noticed. He backed off a pace. Between the two Q’Roth warriors, three times their height, stood a giant Q’Roth, its trapezoidal head red with black slits, the reverse of the warriors’ coloration. Its bloated, purple ribbed belly curved down to the floor supported by two ramrod straight, sturdy legs. Its four other legs looked puny by comparison, protruding from its mid-section like useless appendages. It glared at Micah and the others, excreting pure hate. Beneath its loins, half the size of the warriors, Sister Esma appeared in a burgundy cloak. He glanced at Sandy. Humour – even the sardonic wit variety – was a good sign, and he needed all of them to be on the same side. He detected a fine inverted triangular film hanging behind the Queen’s frame, and decided the Queen had wings, which wasn’t good news. Doubtless she would have liked to fly across and finish them off herself. He planted his legs firm, and stared right back. He felt Sandy’s hand on his shoulder. A new disk arrived close to Zack’s Transpar, carrying an upright lizard, slick brown all over except for glimmering black thorns running from its crown to the tip of its tail. Its forelegs folded onto the ground so that it looked relaxed, bored even. Its smouldering yellow eyes stared forwards, though Micah had the impression it took in everything around it. Micah and the others spun around to see a lime-green Finchikta hovering behind them. Micah tried to focus internally, but nothing happened. “Your resident has been disabled for the duration of the trial. I will translate the proceedings for you.” Its head bobbed like an albatross, though he guessed this creature was vastly more intelligent. He could barely make out the thin line where its upper third eye remained closed. When it spoke, its beak barely opened, but its two sharp orange eyes blazed. The Finchikta’s hundreds of green vermicelli-like legs did not quite reach the ground, hanging like a curtain over its nether region. “Counsel for the defence?” Ramires asked. “In this court, there are only truth, causes, context, and consequences,” it replied. Micah stared out at the swirling vista, suddenly concerned that maybe this wasn’t just an image. “But still, it’s only symbolic, right?” He hoped that whatever happened here, today, that Blake and the others on Ourshiwann might still have a chance to escape or at least defend themselves. He didn’t like the sound of that. “Where’s the judge?” Sandy interjected. “Arriving,” the Finchikta said, orientating its beak upwards. They spotted something descending from way above. At first Micah couldn’t make out what was inside or riding the waves of rainbow-light, but as it got closer, he could pick out the details. Around thirty vertical rings circumscribed the main body, waves of fluorescent light surging through them. Inside the rings was a rounded hourglass shape which barely moved, except that the dark colours in the lower half sometimes squirted up into the lighter upper half of the hourglass, exchanging and sending lighter colours down through its narrow ‘waist’. It made Micah think of some night-time sea creatures he’d once seen, but his analytical mind dredged up a deeper analogy, that of the yin-yang symbol. He realised why, as he noticed a white patch in the lower, dark area, and a black one in the upper, lighter half. He recalled what his Zen master had said once about the symbol: “Most people only see black and white; they forget about the white dot in the sea of black, the black dot in the white portion. In nature there can no more be pure good than pure evil; in the heart of evil there is a speck of good, and vice versa. Nature abhors ultimate states.” Micah found the image fitting for a Galactic judge. An overwhelming impulse overtook Micah, to reach out to Sandy in some way, without offending her or Ramires. He leaned forward to her left cheek and deposited a soft kiss there. She didn’t pull back. Ramires shifted from one foot to another but said nothing. “It has begun,” the Finchikta chirped in a crisp tone, drifting to Micah’s side. Sandy’s hand slipped from his waist, and he faced the Tla Beth, some thirty metres away, its aurora ebbing into a penumbra of rippling pastel shades. “You will now bear witness to the charges,” the Finchikta said. Above the funnel, a swirling spiral of myriad stars appeared. Micah immediately recognised it as their galaxy, the Milky Way. A scalpel-sharp white mesh etched its way outwards about a third of the distance from the galaxy’s white hot centre. The pattern was complex, like some kind of blueprint, but there was a design to it. As it stretched out like vines along a number of the spiral arms, Micah realised it was the Grid, the transport system that was the paragon of Galactic infrastructure, enabling its society to function. It reached fully half the galaxy, a criss-crossing net of curving and intersecting conduits: a skeleton framing the stars. 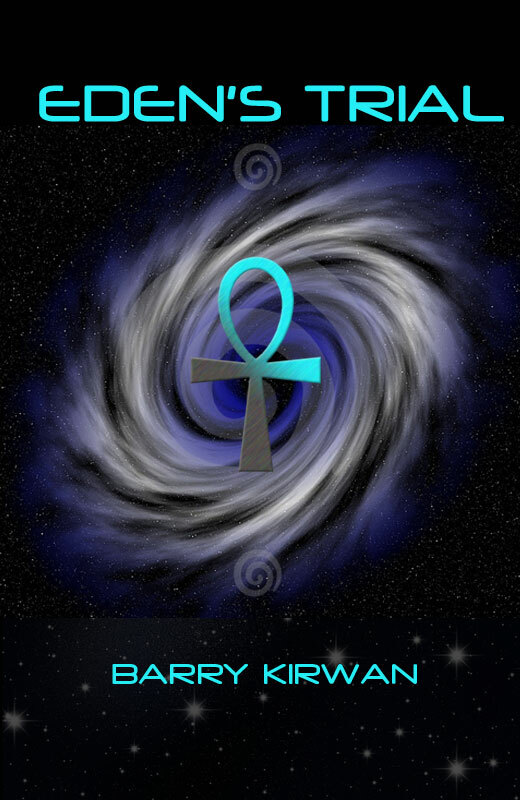 A blue dot pulsed on one of the spiral arms remote from any grid lines or nodes. His jaw fell as an image of a charred, ocean-less, dust-coloured ball loomed large in front of them. He felt as if someone had just punched him in the stomach. Micah gazed toward the judge. A line of fire unfurled from the Tla Beth like a whiplash, latching onto the head of Zack’s Transpar. While the line connected the two, another dot glittered, very close to Earth. “Eden,” he whispered. The image zoomed in, so they could see this sector of space in more detail. Four blue dots zigzagged from Eden towards another distant ball he knew must be Ourshiwann, still far out on the spiral, and a long way from Grid access. A red dot intercepted one of the blues, and was extinguished. The fireline connecting the Transpar with the Tla Beth dissolved. A new one lashed out to Sister Esma, taking her by surprise. Her haughty stance wavered as her face disappeared inside a fist of fire-light. Her body arced as if she was being electrocuted, her arms and legs stretched out to maximum. “What’s going on?” Micah asked, glancing at the Finchikta. “She is being questioned. I have partial access as court official. She sent the one you know as Louise after you, but sabotaged her ship before she left so she could not hope to return to the Alicians. The Alicians made a deal with the Q’Roth a thousand of your years ago to dispose of humanity’s nuclear and nanotechnology, and to bring humanity to Eden. They instigated your third World War. They…” The Finchikta’s beak clamped shut. “What?” Sandy and Micah said at the same time. Micah gazed at Sister Esma’s taut body. Her face twisted in pain. Good, I hope it rips your mind apart. Abruptly the fireline dissipated, and they watched Sister Esma stagger, nearly collapsing. Her face had paled, and she looked shaken. Neither the Q’Roth warriors, nor their Queen, moved to support her. She gathered herself, and stared defiantly at Micah. A deep, guttural voice boomed across the space between them and the Ranger: a series of growls and clicks that put Micah’s spine on edge. “Omnipaths?” Micah wished his resident was online, this sounded important. Micah had no body. His mind floated like a two dimensional sheet of plazfilm, flapping on the winds of a featureless emerald space. He heard sounds: his own voice, as a child, as an adult. He perceived other sheets drifting, slip-sliding in the windless space like a dropped sheaf of paper, each one containing a scene, a memory, voices, people he knew, things he’d seen, things he’d said, more than a few he wished he hadn’t. As they tumbled, he knew the Tla Beth had complete access to his mind and memory. There was no question of lying or even trying to hide anything. He heard his mother crying, his father raging at him when he was a kid. He saw again the aerial nuclear detonations over LA, his younger self sprinting for the shelter to beat the vaporising blast wave; huddling there with his mother when he couldn’t stop shaking; his father calling him a coward; Louise about to kill him; Antonia; Sandy… He wrenched himself back from it all. It was too easy to drown in his own life. His Optron training helped him. He took the astrosurfer’s viewpoint, and witnessed thousands of sheets peppering the green sky: a man’s life dissected – his life. He discerned a common thread in the Tla Beth search strategy: Micah had always been a misfit as a kid, had hated his father, and had been a bit of a geek during adolescence. In the defence case for humanity, his head wasn’t the best brochure available. Abruptly he was back in his body, in a white space. He was standing on something but couldn’t discriminate between floor and space and wall: everything was solid white. A figure emerged and walked toward him. “No, not you,” he heard himself say, as an image of his father approached, in his grey military uniform. At least he didn’t have that disappointed look plastered across his face. She flared, so that Micah knew this was no avatar, it was her. The Transpar materialised into the white construct, opposite Micah’s father. Its crystal surface flashed a pastiche of images, becoming a montage of Blake’s life. Micah had forgotten how much of it had been War-related. He couldn’t keep up with the almost subliminal shifting of events, but noticed that Esma apparently could. He saw her greedy ebony eyes darting about, peering into Blake’s history, scouring his soul. “This needs to be witnessed by all,” his father said. Micah found himself back on the platform. His legs gave way but Sandy and Ramires’ arms caught him. “Thanks,” he groaned, feeling like he needed to throw up. He sagged as he saw the blue-green globe rolling closer and faster into the maw of the funnel. Worse, a dusty orange ball followed close behind. Ourshiwann. Humanity’s fate was slipping closer to the precipice. He’d have to play the next part very carefully. Meanwhile, the Q’Roth planet rotated serenely along the outer rim. “We’re about to see exhibit A,” he said. Above the whirlpool, an image formed, like an outdoor holo. It was the one Sister Esma had spotted, a night-time scene played out in real time. Micah watched with a lead weight in his stomach as Blake, in battle fatigues soaked with blood, fired the slow-gun into his own son’s body, exploding him from the inside. The memory slammed into Micah as surely as if he’d stepped out in front of a hover-taxi. “What’s that witch going on about now?” Sandy asked. Micah didn’t know, but had a bad feeling in his gut. A new image formed. It was another trial, but a human one. There was no sound; there didn’t need to be. Shakirvasta and Josefsson lorded over the proceedings, with the psychologist Carlson in the dock. Carlson was gesticulating wildly. The crowd in the cramped makeshift court room appeared to be shouting too, but there was a heavy militia presence, a new uniform Micah didn’t recognise. Then he saw the image of Blake, his hands cuffed behind him, sitting in a smaller dock, surrounded by four heavies. Whenever he tried to speak he was ordered into silence, then rifle-butted when he didn’t comply. The scene shifted. On seeing it, Sandy let out a cry and buried her head into Ramires broad shoulder. But Micah couldn’t turn away, though it wrenched his heart to stare at the limp body of Carlson, hanging from a noose in the central plaza. There was no one around. His corpse, abandoned, twisted slowly in the Esperantian breeze. Micah’s head bowed towards the ground. He heard compassion and empathy in that calm voice, like he’d never known from his actual father. Something inside him splintered, cracking him like a shell. He shook his head, unable to speak. The Tla Beth’s representation vanished. Micah’s eyes lifted to see the two globes of Earth and Ourshiwann begin their roll inwards, down the slope, towards the point of no return into the funnel, and the cauldron of fire deep within. Is Artificial Intelligence a smart idea?